This is a boat we know well here in Boatshedwales. The first owner who bought her new asked us to sell her for him in 2015. Then we had her through our hands again to the current owner in 2016. The most note worthy change in that time is the engine has just been replaced with a brand new Mariner 115. The original engine was an Evinrude 90. In my opinion with that engine, she felt that she needed a few more horses. She now has. Today this package is the best part of 40k, so with her excellent condition (needs a wash though), the included trailer and new engine with 4 years warranty she is a bargain at £18k ono. No doubt it will come across as slightly unusual to spend 9k on the engine swap and then place the boat for sale pretty much immediately thereafter. There is a genuine reason for this. Please call for details. I have long been an admirer of Oceanmaster. This 570 is their best selling model and rightly so. As walk-arounds go, it is easily the most well thought out design i have ever seen. The deep, safe sides, the space and bow area lay out are all perfect. She even has a small cuddy under the consul. Bags of storage and the highest of quality fittings are also a feature. She has just been antifouled (June 2018) and the first service is also done. 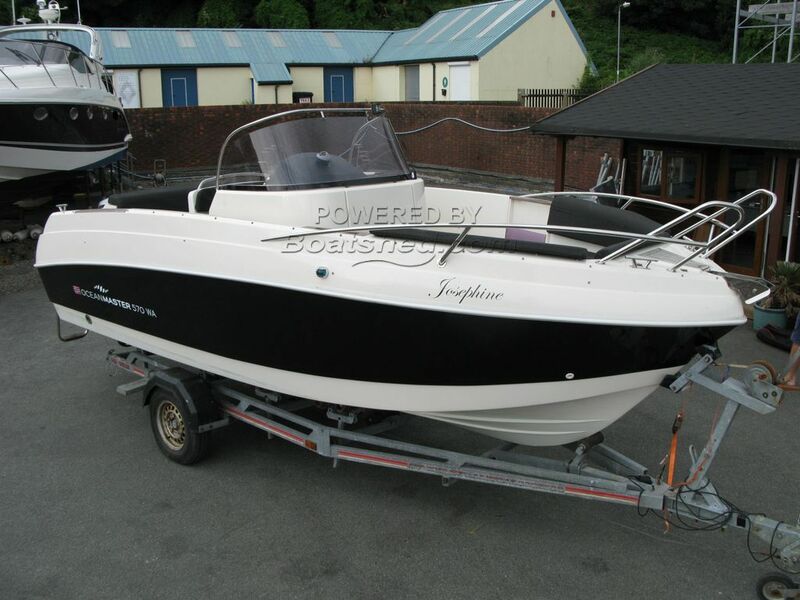 This Oceanmaster 570 WA has been personally photographed and viewed by Mike of Boatshed Wales. Click here for contact details.